This tool is critical to reducing mess and waste when adding sealant. it is possible to go without this tool, and it is pricey for a simple tool. However, simply remove the valve core, screw this on, add fluid and inject the required amount. Recommended but costly. I had watched a few videos online reviewing how you can put Stan's sealant into a tube and put small cuts into it and the sealant will 'heal' the tube. Needless to say I was intrigued and sceptical at the same time. I went ahead and purchased the sealant and Stan's 'The Injector' to put in my tubes. Luckily or otherwise I ended up with a puncture from a thorn in a tube (with removable core) the previous day. So I figured this would be the best 'test piece' as it wasn't fitted to a bike anymore and would replicate a 'good' type of punctures I get. I 'injected' half a syringe of sealant into the tube, pumped it up so the tube was hissing loudly, I then closed the valve core (after disconnecting the pump) and span it like a hoop around my arm (to mimic how it would be if fitted to a moving bike). To my amazement the hissing stopped nearly immediately and the tube kept the majority of air I had put into it. I then left it over night and checked the tube, it was still pumped up and sealed (has remained that way for around a week now). Needless to say it was promptly applied to all my bikes with removable cores. I have covered approximately 1000 miles on various bikes, both on and off road and have had no preventable punctures (stone cutting tyre side wall doesn`t count). To remove presta style valve cores you will need a seperate tool, however everything else you require is included. As a foot note, the sealant can make a mess when 'The Injector' is removed (no matter how careful you are) so make sure you keep a rag handy. This works well for adding sealant via the valve. Just screw in the black connector to the valve (after removing the core) and use the measuring marks on the side of the syringe. Easy. Good for measuring the correct amount but this does not come with the tool for removing the valve core on Stans valves so had to take tyre off rim and use it to pour in sealant. Was less messy than before.. I have successfully used conventional syringes previously. The Stan's is physically expensive, but makes the the job quicker cleaner, and less of a chore. So well worth the money if you are into tubeless. Helps to make changing or refilling tubeless tyres a breeze! Makes adding No Tubes fluid into tyres and inner tubes very easy, no mess or waste. Seems expensive but it works really well. Getting the slime in with minimal disturbance to the seal is worth it - given the frantic pumping I normally need to get them reseated!! Makes adding sealant a less messy affair! Clean and easy to use. I bought this because the picture has a brass connector, but it came with the black plastic connector that everyone now carries. The Injector works well and makes the job of filling sealant a no-brainer. Seems expensive but makes life so much easier - if you run tubeless get one! As others have said, have the right tool for the job makes it much simpler and this injector just makes the job of filling the tyre with sealant so much cleaner and simpler. Makes going tubeless effortless. Don't settle for less. Yes it is a 'nice to have' and not essential but for the hassle free stans injection it is perfect. So much easier than trying to pour into the tyre before completely installing it. A prime example of having the correct tool for the job and making life easier for yourself. If you have hard to fit tyres, you know the ones that take two people to fit because they are that tight, this saves you and the floor from becoming covered in sealant. Even if your tyres are easy to fit it make setting up a tubeless tyre so much easier. Useful and much easier than partly removing a UST tyre to top up the Stans fluid. Also works very well to inject Stans fluid into innertubes. Perfect for adding more sealant to a tubeless tyre without having to unseat the tyre from the rim. Works well and saves partly removing tightly fitting tyres. Easy to use . Pleased with the purchase. Wow v pleased with this, I know it's 'just' a large syringe with a hose and adapter but it does th job perfectly . Just make sure you wash it out carefully!! Beats levering the tyre off and trying to pour goop in through a small gap!! Good product. Helps to save the old liquid left in the tyre when you change them. Recommended, saves mess and makes job easy. The Best Tubeless Kit, I bought from Merlin Cycles and excellent value as well! Handy for replacing old sealant without having to de-seat the tire. 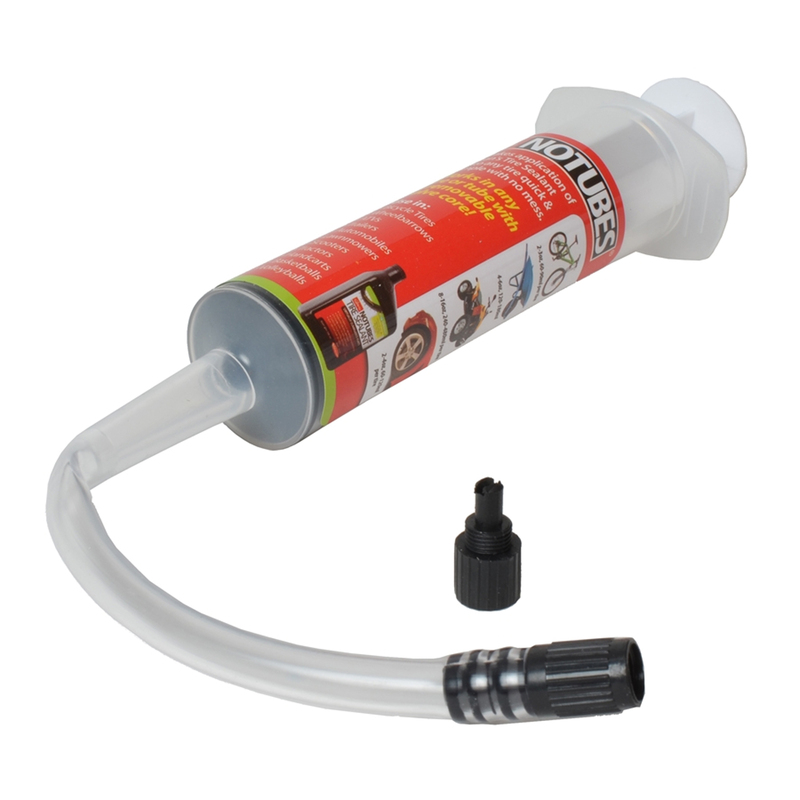 Very useful for using sealant with existing tubes. Couldn't use with the tubeless setup as Mavic valves don't have removable cores, but there you go... live and learn as they say. Have used with tubes in other bikes, so still a useful addition to my toolbox.